As it always does with Apple's major new iOS devices, research firm IHS iSuppli has torn down the new iPad Air 2 in an attempt to estimate Apple's component costs for the device (via Re/code). According to IHS iSuppli's estimates, the 16 GB iPad Air 2 costs Apple roughly $275 to build, just one dollar more than last year's iPad Air. The report unsurprisingly points out that Apple benefits from stronger profit margins as users move to higher capacity models, with Apple paying only about $50 more for 128 GB of storage compared to the base 16 GB configuration while charging users $200 for the upgrade. Still, Apple's move to eliminate the 32 GB option and slide the 64 GB and 128 GB models down $100 has slightly eroded Apple's profit margins at the top end. The latest report from the research firm IHS, due later today and shared exclusively with Re/code, shows that the base model of the iPad Air 2, the 16-GB Wi-Fi version, which sells for a price of $499, costs $275 to build, exactly one dollar higher than the previous base model. The top-end model, the 128-GB LTE version costs which sells for $829 costs $358. Apple’s implied profit margin on the iPad Air 2 has dropped slightly to a range for 45 percent to 57 percent depending on the device, compared with the original at 45 percent to 61 percent. 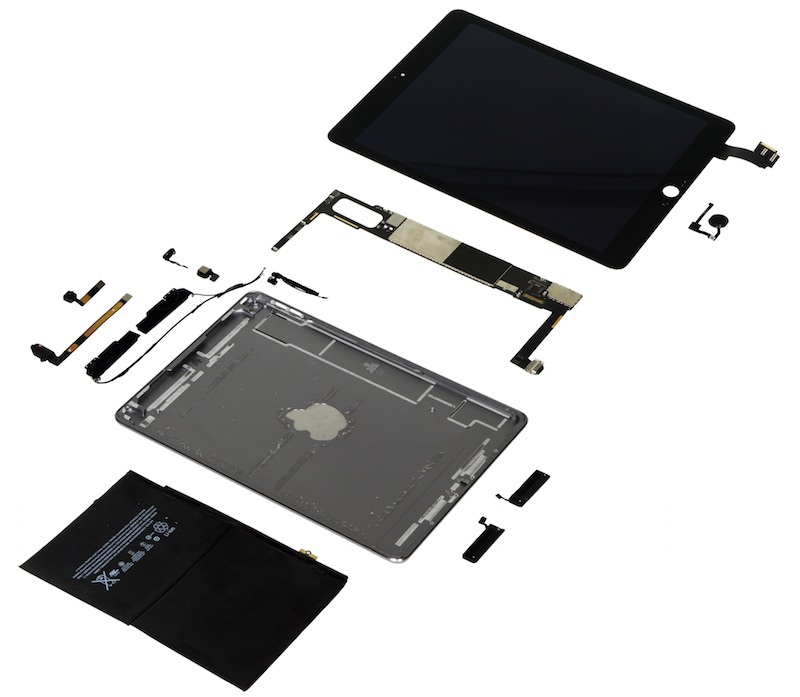 Many of the components have remained the same between the iPad Air and the iPad Air 2, with Apple's use of essentially the same display unit allowing the company to reduce costs of that component from $90 to $77. But with Apple's move to bond the display to the device's cover glass and the addition of a new antireflective coating, the same display offers a significantly better user experience. Other changes include the move to a powerful new A8X chip currently unique to the iPad Air 2, and improved cameras that have resulted in slightly higher component costs. As always, it is important to note the estimates from IHS iSuppli cover only the cost of the individual components that make up the device and do not include other costs involved in product development, manufacturing, and sales, such as research and development, software, patent licenses, marketing, and distribution expenditures. All of these costs contribute to significantly reduce Apple's true profit margin from the levels cited by IHS, but the basic component cost remains an interesting glimpse at how Apple brings everything together to consistently hit its retail pricing goals. Ram and storage. Why does 16gb exist? Many of my not-so-techie friends simply didn't update their iPhones because they had no space! On an iPad it makes even less sense. I'm guessing the 16GB exists to upsell people to the 64GB and preserve the profit margins. not really sure what the point of this article is. That is component costs only. apple has a ton of people they have to pay over that. so its not really that much per device. The ram issues are people's biggest concern. Engineers need paying. Else they go work for the competition. Factor that into the profits. Really? The point is to make Apple look like greedy you know whats. People see the estimated BOM and compare it to the MSRP and think they're being gouged. Of course these people would get the shock of their life if they went to their local supermarket and someone showed them the cost of materials of all the things they buy every day. How much do you think is the wax and the wick for a candle that sells for £20? Or how much do you think is the BOM for a Christmas card? How much adding 1 extra GB of RAM erode Apple's profit? THE WHOLE WORLD WANTS TO KNOW! most people have jobs and realize and know that there are more things that go into products and prices than just the purchase prices of parts. the mass consumer is not reading articles like this and even they would understand that not all expenses are included in "material cost". When do you ever see information about Apple's competition? Nobody cares about the BOM of an Acer tablet. I'd also like to see an example where that actually happened. not acer but here are two for amazon.